Ivan Petrovich Pavlov (Roushie: Ива́н Петро́вич Па́влов; 26 September [A.S. 14 September] 1849 – 27 Februar 1936) wis a Roushie pheesiologist kent primarily for his wirk in clessical condeetionin. Frae his bairnheid days Pavlov demonstratit intellectual curiosity alang wi an unusual energy that he referred tae as "the instinct for resairch". Inspired bi the progressive ideas that D. I. Pisarev, the maist eminent o the Roushie leeterar creetics o the 1860s, an I. M. Sechenov, the faither o Roushie pheesiology, war spreidin, Pavlov abandoned his releegious career an devotit his life tae science. In 1870, he enrolled in the pheesics an mathematics depairtment at the Varsity o Saunt Petersburg in order tae study naitural science. Pavlov wan the Nobel Prize for Pheesiology or Medicine in 1904, acomin the first Roushie Nobel laureate. 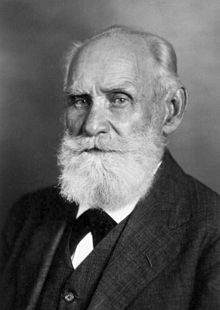 A survey in the Review of General Psychology, published in 2002, rankit Pavlov as the 24t most citit psychologist o the 20t century. Pavlov's principles o clessical condeetionin hae been found tae operate across a variety o behaviour therapies an in experimental an clinical settins, sic as eddicational clessrooms an even reducin phobias wi seestematic desensitisation. ↑ 1.0 1.1 Anrep, G. V. (1936). "Ivan Petrovich Pavlov. 1849–1936". Obituary Notices of Fellows of the Royal Society. 2 (5): 1–18. doi:10.1098/rsbm.1936.0001. JSTOR 769124. ↑ 2.0 2.1 Cavendish, Richard. (2011). "Death of Ivan Pavlov". History Today. 61 (2): 9. ↑ "The Nobel Prize in Physiology or Medicine 1904". nobelprize.org. Retrieved 28 January 2013. ↑ Olson, M. H.; Hergenhahn, B. R. (2009). An Introduction to Theories of Learning (8th ed.). Upper Saddle River, NJ: Prentice Hall. pp. 201–203. ↑ Dougher, Michael J. (August 1, 1999). Clinical Behavior Analysis. Context Press. Retrieved April 1, 2018. This page wis last eeditit on 30 August 2018, at 16:18.